This painting was created as a celebration of the unique spirit of the Williams Community. The original design came to fruition after participants shared personal stories of how they took brave stands for ideals they were passionate about. In the past few years, students have found unique ways to initiate uprisings and protests that have occurred at Williams regarding hate crimes and charged, political initiatives. Students also expressed a passion for growth and a dedication to continuing to fight for their ideals. This art is even more of a dedication to the goals they wish to attain as a community, such as taking alternate, unique, paths to combat stereotypes and prejudice, than a celebration of what they have already achieved. The pattern used in the painting stemmed from the famous MC Escher painting of fish and birds. In this painting the pattern was changed to fish and doves flying in the same direction. The fish represent the majority in society. The doves are representative of Peace, but most of the doves in the pattern are not painted in the actual pure white color of a dove to show that Peace is often unattained when you take the easy route or common path to find it. 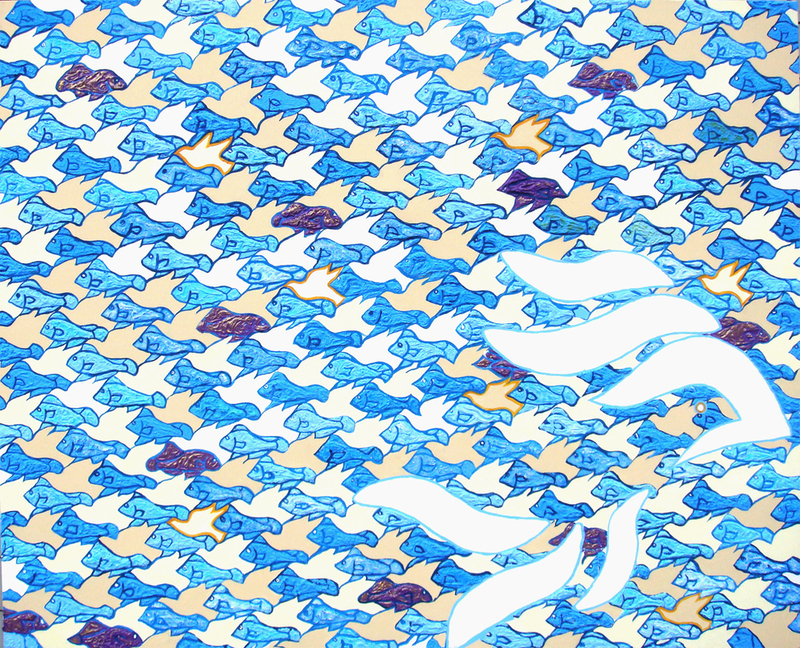 Some of the fish in the pattern are swimming, up stream. These fish are representative of the Williams community as they are doing something uncommon for fish, swimming against the current. This action represents their commitment to taking unique paths to attain their goals. The fish are painted in purple and gold, the Williams College colors. The purple fish are swimming in the direction of the large dove in the right corner of the painting. This dove represents a Peace that can only be attained by going against the grain and taking an unexplored route to achieve it.